Find the quiet, comfortable home you've been seeking at Amber Place in Warner Robins, Georgia. We offer expansive one, two, and three bedroom luxury apartment homes near the Robins Air Force Base. Have the satisfaction of choosing from one of our eight expansive floor plans. This is your home; customize it the way you like it best. We make it easy for you to relax and unwind in style. Rejuvenate in the sauna. Take a dip in our saltwater swimming pool. Challenge your limits in the fitness center. 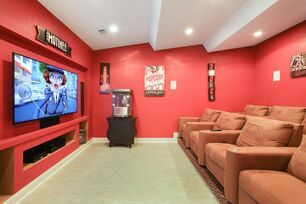 Catch a flick in our movie theater. Exercise your pet at the Bark Park. This is more than an apartment community, it's your retreat in Southwest Warner Robins.